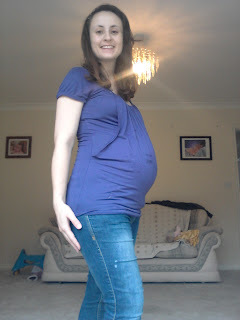 Well 33 weeks pregnant has been and gone, this pregnancy is flying by! I actually left work when pregnant with Annabelle at 33+6 weeks and I was ready for a rest then, on the same day with this baby I was thinking I have a lot more energy but could really do with 6 weeks off :) No Chance! I have had a lot more energy properly as I have been taking Iron tablets. When im tired I get really anxious which worries me as it makes me think i will get anxiety. I hope im not as could really do with not having it again! I'm not going to lie I have had a bit of anxiety since having Annabelle but its manageable. I have been listening to hypnotherapy mp3s and they really help me think relaxed and think clearly! My bump is growing but still look small to other people, but I'm not worried. Plus how would I run after my children if I had a big bump!